On day six of a partial government shutdown, negotiations among Democrats, Republicans and the White House appear to be going nowhere. The Senate was expected to be in session Thursday to continue negotiations, but with a deal to reopen the government nowhere in sight, lawmakers didn't show up. The Senate was in session for a grand total of four minutes Thursday. Lawmakers aren't expected to be in town until after the New Year next week. Earlier this afternoon, a notice from the GOP House Whip's office was sent around advising members that there will be no votes in the House this week, either. This makes it very likely that the shutdown will continue into the New Year, barring some kind of miraculous breakthrough in negotiations. The impasse has left about 420,000 federal workers working without pay and another 380,000 furloughed. The biggest sticking point for negotiators is the president’s request for more money for the border wall. Democrats have dug in and are refusing to give in to Trump’s demand for $5 billion. President Donald Trump listens during a signing ceremony for criminal justice reform legislation in the Oval Office of the White House, Dec. 21, 2018, in Washington D.C.
During a surprise trip to visit U.S. troops in Iraq on Wednesday, Trump hammered Democrats for resisting his demands for border wall funding and said that stopping terrorists from entering the U.S. is part of a broader homeland security strategy. "I don’t know if you folks are aware of what’s happening -- we want to have strong borders in the United States, the Democrats don’t want to let us have strong borders," he said in his speech at Al-Asad air base. "Only for one reason. You know why? Because I want it. "I think I’ll say, I don’t want the wall. And then they’re going to give it to me! I figured out the solution." Trump remained in Washington through the Christmas holiday, instead of traveling to Florida, and fumed to reporters on Tuesday. Over the weekend, Vice President Mike Pence reportedly offered Senate Minority Leader Chuck Schumer a deal to include $2.1 billion for border security in the spending bill, which is less than Trump’s initial demand but more than the $1.3 billion for “fencing” that Schumer has advocated in recent days. It’s believed that offer from the White House was rejected. Schumer’s office has not responded to a request by ABC News for comment. 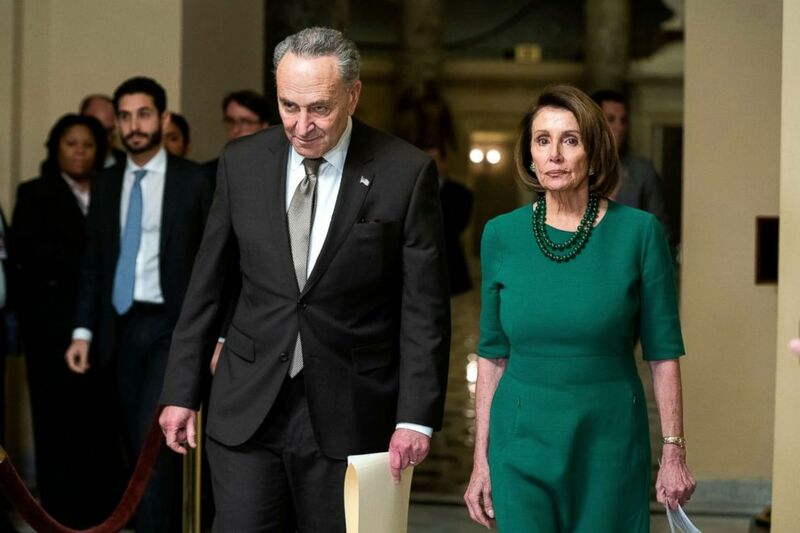 Nancy Pelosi, right, and Chuck Schumer arrive to speak to the media as lawmakers prepare to vote on a new budget resolution to avert a government shutdown at the US Capitol in Washington, Dec. 20, 2018. 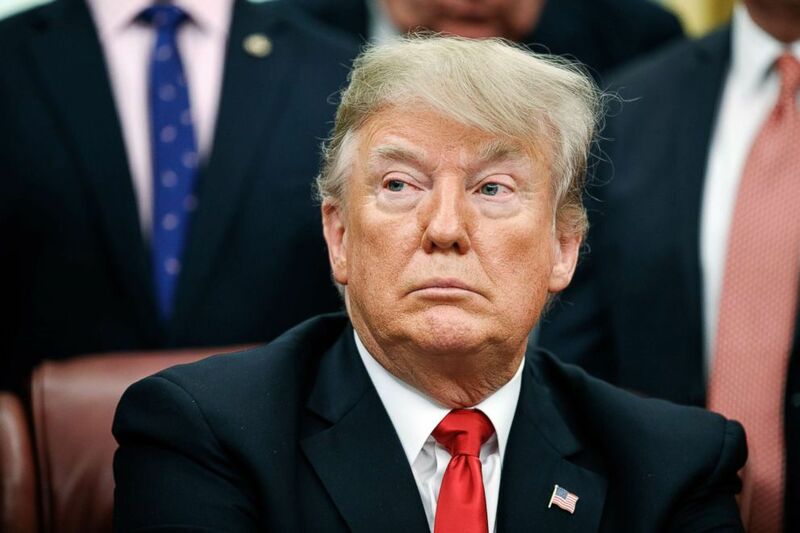 Trump argued Tuesday that federal workers support his position in the fight with Democrats over billions of dollars in funding for the border wall. "Many of those workers have said to me and communicated, stay out until you get the funding for the wall," he said, when asked for his message to the hundreds of thousands federal workers either furloughed or working without pay. "These federal workers want the wall. The only one that doesn't want the wall are the Democrats," he added. Meanwhile, the lead negotiators for the Democrats: Sen. Chuck Schumer and House Speaker-elect Nancy Pelosi, aren’t backing down. “Instead of bringing certainty into people’s lives, he’s continuing the Trump Shutdown just to please right-wing radio and TV hosts.Meanwhile, different people from the same White House are saying different things about what the president would accept or not accept to end his Trump Shutdown, making it impossible to know where they stand at any given moment,” they said. The chair of the House Freedom Caucus, Rep. Mark Meadows, R-North Carolina, who encouraged Trump to shut the government down over his demand for $5 billion for the wall, accused Democrats of not budging on their refusal to fund the wall because of their "hatred for the president." On Wednesday, Meadows told ABC News that "no substantial progress" has been made since discussions broke down over the weekend.